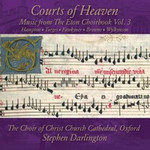 "Courts of Heaven – Music from The Eton Choirbook Vol. 3"
If ever a graceful gift was deemed from the powers above, it would be to extoll purities of the human voice. For nearly 30 years, Dr. Stephen Darlington has continued the fine tradition of glorious singing which has been circulating in and around the walls of Christ Church for almost 500 years. This is the third volume featuring works selected from The Eton Choirbook, a magnanimous collection of sacred music transcripts that includes one Passion, Magnificats and motets. The first two volumes have recently been nominated for Gramophone awards. Conceivably, "Courts of Heaven" will follow in their footsteps. Antiphon Salve regina opens and ends this CD but with differing composers. John Hampton’s initiating piece is supplemented with additional tropes and passages. The Choir’s voices radiate with sweet melodies like the translucency of clerestory windows. The version for five voices penned by Robert Wylkynson is expressed with soaring, angelic lines. In the Gaude flore virginali by Edmund Turges, Darlington’s male voices are deeply profound and possess undulating richness. The middle section is particularly soothing to the ear. Embedded within the Gaude virgo salutata we hear pristine reaches of chorister Binath Philomin who transcends his notes into the air with softness of a white dove. This Fawkyner piece, anchored with the cantus firmus Martinus Abrahe sinu, is rendered magical by The Choir of Christ Church. Vocal parts blend effortlessly. Acoustics for "Courts of Heaven" (recorded at the Chapel of Merton College) are unblemished. Liner notes by Timothy Symons go into expansive detail surrounding those gentlemen who greatly contributed to the immensity of The Eton Choirbook. Darlington and his ensemble are extraordinary.